Food warmers and pumps are necessities for sauces that tend to harden when cooled. A food business may choose to offer self-serve sauces to customers, or make serving easier for restaurant staff, by having food warmers available during service. Ladle-and-bowl food warmers are great for serving sauces or soups, when exact portion sizes will not make a significant difference in profits and dish taste. When portion control is important, food warmers with pumps, such as nacho cheese dispensers, are a great option. Below is a comparison of four food warmers on the market, each ideal for a certain food business purpose. Product Name Paragon 2029A Pro-Deluxe Dual Warmer with Ladles Paragon 2029E Pro-Deluxe Dual Warmer with Ladle and Pump Star 3WSA-HS 3.5 qt. 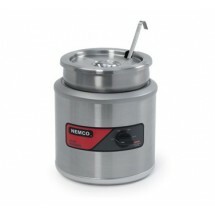 Food Warmer with Pump & Heated Spout Nemco 6100A Countertop Round Warmer 7 Qt. Best Use Heating and keeping nachos, caramel sauce, and hot fudge warm Serving various sauces, allowing portion control on one of the sauces Nacho cheese dispensers Keeping large quantities of sauces, soups, or other liquids warm. Comments This warmer has an easy-to-clean shape and can therefore be used for a wide variety of sauces and liquids, when the food business is not concerned with portion control. Adjustable serving sizes on the pump are great for keeping profit and portion control, when high food cost sauces are offered. Paragon warmers have received very positive reviews. This warmer/dispenser has the benefit of a heated spout, which can help prevent buildup. 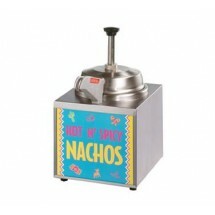 However, the printed design limits use to nacho cheese dispensers only. Other models are made for butter and other liquids, but each is specific to one sauce type. 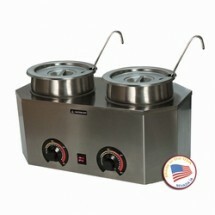 This large sauce and liquid warmer is ideal for catering events and buffets. 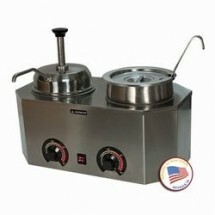 It can provide warm soups, chili, or sauces in bulk, yet is affordable.